I’ve been humming the tunes from The Wizard of Oz all day, because I just made a mask based on photos of the Wicked Witch of the West. Although Margaret Hamilton’s makeup artist didn’t give her creepy skin, I decided to give her some weird, leathery skin anyway. It looks particularly fetching in green. I show you how I got that texture in the video. 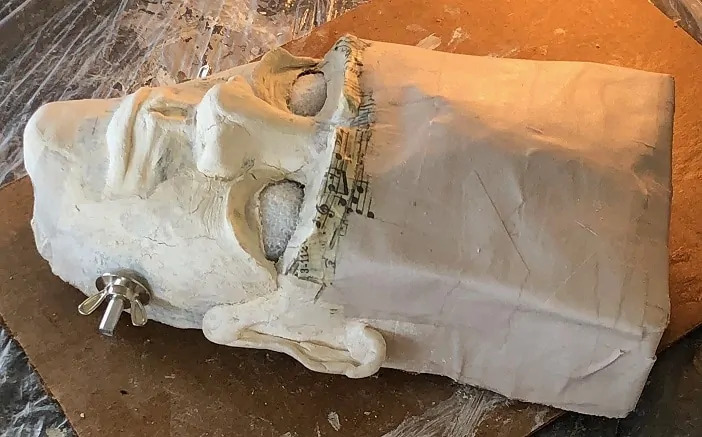 If you missed the video that shows how the Plastilina Modeling Clay was formed over a skull to make the form for the paper mache, you can find it here. And several people have asked where I got the skull. I bought mine several years ago on Amazon.com. As I mention in the video, the skull isn’t the same size as my face, so the mask doesn’t fit – but sculpting over the skull is a lot of fun, and I highly recommend trying it if you want to practice sculpting faces and you don’t want the molded features on a mask form to get in the way of your creativity. One thing I forgot to mention in the video is that I used some of the sculpting techniques that I learned from Adam Reeder’s video to help me get close to a likeness of Margaret Hamilton’s features. I wasn’t trying for perfection (this is just for fun, after all), but I think I came pretty close. I really should mention Adam’s video more often – I’ve watched a lot of videos about sculpting faces, and his ideas just seem to work best for me. I haven’t decided what mask to make next. Do you have some ideas for me? 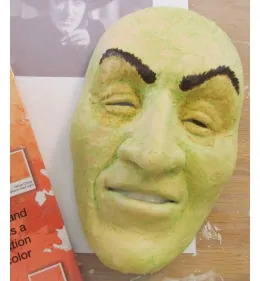 Waiting for my first-ever paper mache mask to dry, I found this post and absolutely know that I have to incorporate the textured skin technique into this piece! I’ve been an artist / crafter / maker for my entire life, but I haven’t done paper mache since my high school art classes, and even then it was a 1-time, “how-to” project. I’ve recently started creating wreaths and decided that I need mine to be different than what everyone elses makes. I’ve used store bought masks that I’ve embellished, but I’m hoping to bring it to a higher level with more unique, paper mache embellishments and focal points. I just wanted to thank you Jonni, and everyone else that posts their amazing works of art for sharing their tips, and techniques. Such an inspiring group! That’s a great mask, Barbi. What did you use to make it? I agree that the textured skin would work really well, and it would make a nice contrast with the real metal bolt. Thank you for the reply, Jonni. I used a plastic “Creatology” brand mask for the form, slathered in petroleum jelly, then paper strips with pva/water as a paste. I tried flour & water, but I live in the gulf coast of Florida so it got funky really quickly and I just didn’t like using it. I also built up the base layer after it dried with cardboard and sculptural and modeling wire mesh from my art supplies stash. To define the features and give my monster “life”, I used some store bought air dry clay that I’ve had in my studio for a while and it seems to be working well. Wow – that was quite a project. And your wreath business is quite creative, too – I hope it does really well. I would like to make a mask for a Halloween costume. Hi Maggie. Yes, they can wear them. You’ll want to varnish the inside of the mask to seal it. It’s also a lot more comfortable if you put a few strips of foam on the inside, so air can circulate. Masks can get quite hot inside if you wear them for any length of time. Kids really have fun at Halloween if they get to dress up as a favorite character, and if they get to help make their costume. Hi Jonni, First of all i want to let you know that i love your work! I am having a circus birthday party for my grandson and i thought about circus animals. I saw the elephant and the giraffe webs and i love it. 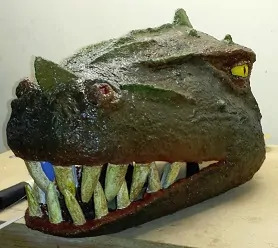 i have never tried paper mache and im a little nervous about how to go about it. Especially the giraffe! Any advise? Hi Lisa. Will you be making full-sized, four-legged animals, or just the heads? I do have the video and patterns for a baby elephant, of course. A lot of people have followed those instructions and their elephants come out really nice. The giraffe will be more difficult, especially if it’s going to be displayed around kids, because a giraffe shaped like a giraffe will fall over with the slightest breeze. We do have a guest post here by Michelle, who made a full-sized adult giraffe. She made it using the techniques shown in the elephant video, but padded the body with lightweight plastic bottles (you could also use bubble wrap) to keep the weight down. She also attached it to a plywood base to keep it from falling over. Good luck with it. How long do you have before the party? Thank you for the inspiration and in working with paper mache. Your techniques are very original. I made the halloween mask for a total cost of about $1.50 since I had the flour and hot glue already. The paint is left over when I painted the front door of our house and the eyes are made from a broken ping-pong ball I got from work. The $1.00 was spent at the dollar store for “poster paint”. I don’t even know what that is, but I just need the color in a paint format. The only challenge I had was keeping my dogs from eating the sculpted teeth that I made from paper mache glay. I guess it was like the treats we give them. Anyway, thank you for the inspiration; it was a lot of fun. Whoa – that’s amazing! Wonderfully scary, lifelike, and cheap, too… Nice work, Jim! Hi Jonni! Thank you so much for sharing your expertise! I made some masks last year for my daughter’s Nutcracker production, using your blue shop towel/ plaster & glue technique– they turned out great! Now I’m taking on the Rat King headpiece. I’m really interested in trying your paper mache clay recipe for this. Can I build this clay up over a form and have it be strong enough on its own after it’s dried and released? Should I incorporate some chicken wire? How thickly can it be applied? Can it be dried in the oven? Can I use the blue shop towel/paper mache as an under layer and finish off with the clay? Oh, and lastly, it sounds like it’s hard to sand, what about trimming edges? Thanks for your time! Hi Val. Yes, you can add paper mache clay over the shop towel mache if you want to. If you’re making a large mask, you might want to do a little test run with the materials before you begin, just to see which ones you like. The paper mache clay dries really hard, and isn’t easy to sand, and if you build it over a form the inside can sometimes have little pointy bits that are uncomfortable. 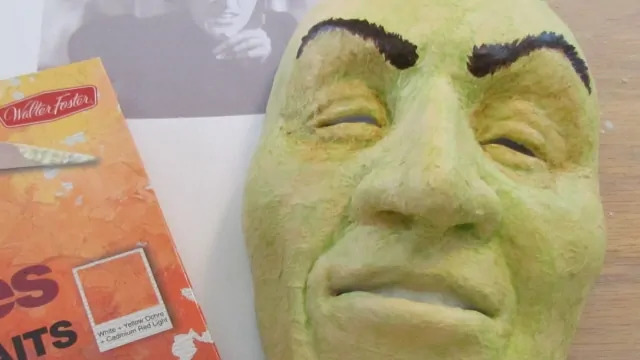 You can make a mask using the paper mache clay (don’t use the linseed oil, though, because of the chemicals near the face) but I think you might prefer to use one of the other options. I think I’d go for the shop towels and fast-setting paste, three or four layers, or even more, to make sure the finished piece could hold up to a lot of handling, and then do any fine detail work with the air-dry clay recipe, because it’s easier to sand and comes out smoother. 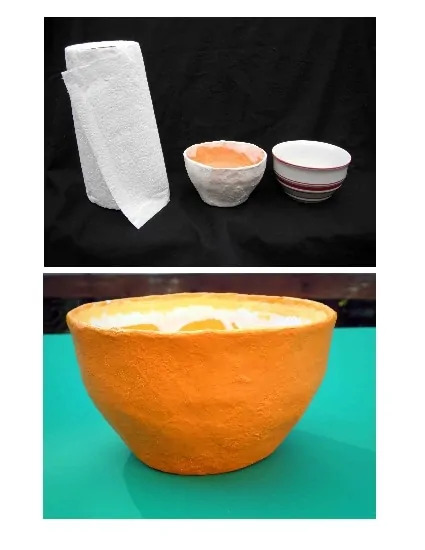 You can dry paper mache in the oven around 200° F. Sometimes the drying actually happens faster if you put the piece in front of a fan, instead. As for the chicken wire, I try to avoid it when making a wearable item, just because accidents happen and those sharp points could hurt somebody if they fall. If you think reinforcement is needed, I’d suggest using cardboard instead. But that’s just a personal opinion. If you test the materials before making the final mask, you’ll be able to tell if reinforcement is needed. I generally try to keep any layer of paper mache clay under 1/4″ – so it will be able to dry all the way through as fast as possible. More clay can then be added on top, to finish any details. I hope this helps. Be sure to let us see your Rat King headpiece when it’s done! Thanks Jonni! You’re a wealth of info and I appreciate you being so responsive. I’ll send a photo when I’m done. Nice Jonni! How about a mask of the flying monkeys or the guards from the Wizard of Oz? You could have a whole theme this year. You could even do the cowardly lion, scarecrow, tin man……Anyway, it looks as if you are having fun. I just love working with the glazes myself. It has added a whole new dimension to my work. You are great in capturing the faces, they actually look like who they are intended to look like. Thanks, Eileen. Good suggestions. I’m in the middle of moving all the stuff out of my studio so I can sand the floor, so I may not get as many masks done by Halloween as I wanted to. But one of those monkeys – that would be fun! Jonni, I love that mask. I used the paper towel technique to give my orange bowl its orange peel texture. It is a great and cheap way to texturize paper mache projects. Here is the photo of the bowl that I made with the paper towel. Orange peel texture on an orange bowl – I love it! Thanks once again Jonni … your inspirational …..used clay to cover with pm. It’s in the attic for last week… Going to check. Hope it hasn’t hardened. Will post when cooked. ..
Great technique! Love her final color. Hmmmm….how about a pumpkin face mask of sorts as a suggestion? Ooh – a pumpkin face mask would be fun! I haven’t tried paper mâché since I was in grade school working on a globe for a project. So understand I am beginner’s level. My good friend’s birthday is coming up and knowing how much she loves pugs, I decided to make her a pug wreath. I started searching on the internet and came across your website. I bought one of your books and started studying how to make a pug face out of paper mâché. I used half a styrofoam ball and formed a pug nose and mouth from masking tape and newspaper. I didn’t feel comfortable doing eyes, so I used those comical wiggly eyes you get at the art store. I covered it with your clay recipe and painted it. Anyway, I absolutely loved doing this project for my friend and I can’t wait to give it to her. I am looking forward to my next paper mâché project! Karen, I would love to see your pug! Could you post a photo?